Lani Greenhalgh is a chef at The Laughing Heart in Hackney. A native of Byron Bay, Australia, Lani trained at some of Australia’s top restaurants, including Cutler & Co in Melbourne and the iconic neighbourhood bistro Estelle. After eating her way through Southeast Asia she returned to Byron Bay, where she spent the next two years at Harvest, a sprawling hinterland restaurant and bakery focused on organic and foraged produce. It was here she met chef Josh Lewis, who took Lani with him when he opened Fleet, the now legendary regional bar/restaurant in Brunswick Heads. Lani spent some time honing her pastry skills in fancy hotels in Byron Bay and Hayman Island, then travelled through Europe, including a stint on a project to convert a fishing boat into a restaurant in Northern Norway. 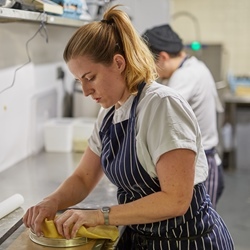 Lani now works with Tom Anglesea at The Laughing Heart, where she hops between the pastry and savoury sides of the kitchen. In her free time, she works toward her undergraduate degree in Cultural Studies and Communications.